Vancity developed an endowment fund with the Vancity Community Foundation to respond to the Syrian refugee crisis and support local charities who provide a wide range of support for refugees. Since the launch of the fund, Vancity has been matching all donations to a total of $125,000. To date, funds have been distributed to on-the-ground refugee camps and to Immigrant Services Society of BC who give support to local charities doing on the ground work with refugees. The funds support initiatives such as: trauma counselling, language training and childcare allowing refugees the opportunity to seek employment, as well as other important aspects of settlement. Let’s come together, in this time of need and contribute some dollars to support our new neighbors. Here’s how you can help. From Dec. 1 onwards and throughout the coming year any funds you donate to the Vancity Humanitarian Fund will be matched and designated to local charities that help refugees settle in our communities. Gifts of $20 or more will receive a tax receipt. Vancity members can give through online banking using the “Pay Bills” function and choosing the VCF Donation form (in the right side bar menu). Select the Vancity Humanitarian Fund from the drop down menu. Give directly to the Vancity Community Foundation. 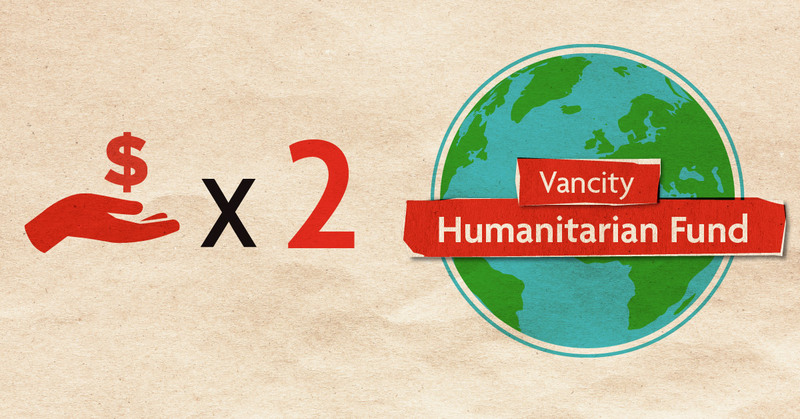 Anyone can make a donation using Visa, Mastercard, or Amex to the Vancity Humanitarian Fund directly. Receipts are generated automatically. 1 Instructions to donating points online: Go to My Visa Rewards Plus and select “Donate now”. Log-in. Click “Donate now” again and enter number of points you'd like to donate, then enter “Vancity Humanitarian Fund” in the “Name of registered canadian charity” box. Then hit "Submit".